Overall, Americans’ views of the current state of the national economy are little changed since a year ago. About half of adults (51%) rate national economic conditions as excellent (11%) or good (39%), while 49% characterize economic conditions as only fair (35%) or poor (14%). Positive views of economic conditions are buoyed by Republicans and Republican-leaning independents: 75% rate economic conditions as excellent or good. These ratings are little changed over the past year; Republican views of the economy have been much more positive since Trump’s election. 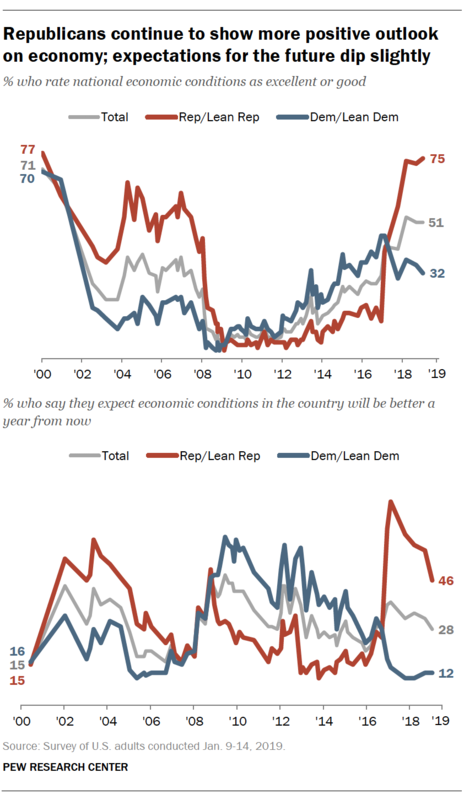 Republicans also remain more optimistic than Democrats in expectations for the economy a year from now: 46% expect economic conditions will be better a year from now, while just 12% of Democrats say this. However, GOP optimism has declined since September, when 57% of Republicans said they expected conditions would be better; still, just 6% of Republicans expect conditions will worsen (45% say they will stay about the same). Views among Democrats are little changed since September: 12% expect economic conditions to improve in the next year, 41% say they will get worse, while 45% expect things to stay about the same. Overall, there has been little recent change in Americans’ views of their personal financial situation. Today, about half (51%) say their personal financial situation is in excellent or good shape, while about as many say they are in only fair or poor shape (48%). As was the case in September, there is a sizable partisan gap in these views. Republicans continue to be more likely than Democrats (62% vs. 44%) to rate their personal financial situation as excellent or good. 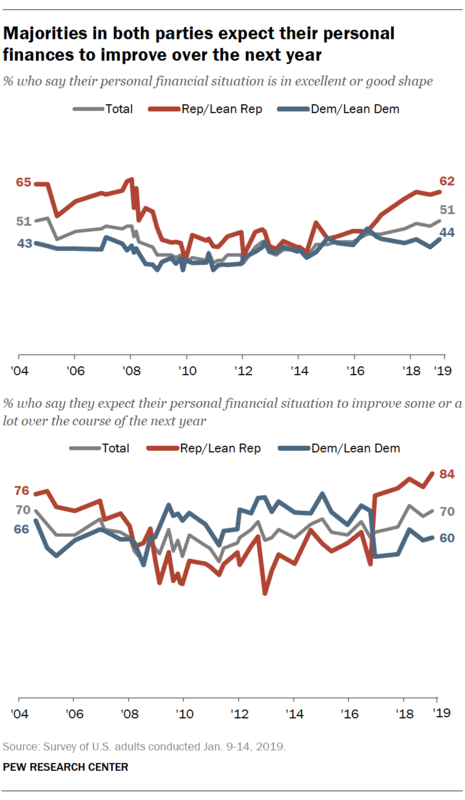 Republicans also remain more likely than Democrats (84% to 60%) to say they expect their finances to improve over the next year. Six-in-ten adults now say there are plenty of jobs available in their local community – the highest share recorded since the question was first asked in 2001. Just a third say that jobs are difficult to find. Positive views of the availability of jobs locally has risen since the question was last asked in October 2017, generally tracking with more positive views of the economy over this period. Then, half of adults said there were plenty of jobs available where they live, while 42% said jobs were difficult to find. 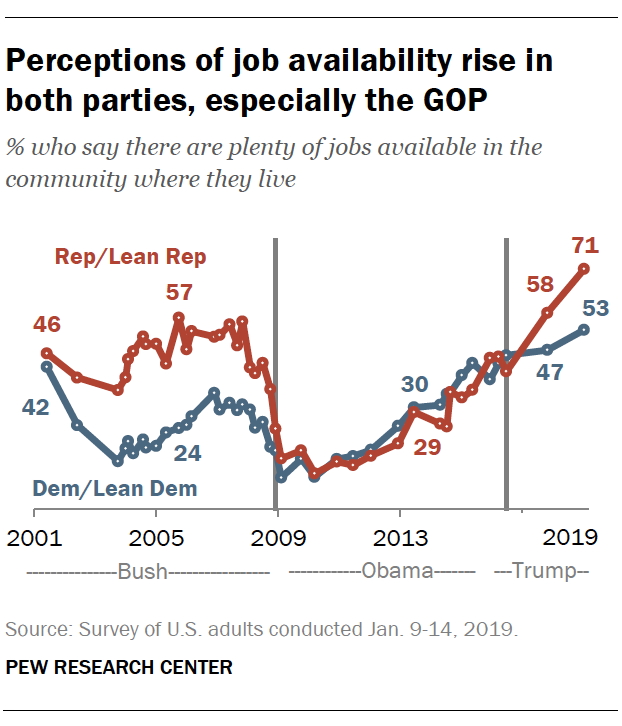 As is the case with other economic measures, there is a sizable partisan gap in views of job availability. Currently, 71% of Republicans say there are plenty of jobs available, compared with 53% of Democrats. In October 2017, 58% of Republicans and 47% of Democrats viewed jobs as widely available locally. In both parties, views of local job opportunities are among the most positive as at any point in the last two decades. About half (48%) say there are plenty of good jobs available in their communities, compared with 45% who say that good jobs are difficult to find. The trajectory of opinion on this question is also positive. In June 2016, just 31% said there were plenty of good jobs available. A majority of Americans (54%) say either that their family’s income is going up faster than the cost of living (11%) or staying about even (43%). About four-in-ten (44%) say their incomes are falling behind the cost of living. These evaluations are somewhat more positive than in recent years. In October 2017, 49% said their incomes were at least keeping pace with the cost of living. There are substantial demographic differences in these evaluations. For instance, 58% of blacks say their family’s income is falling behind the cost of living – much higher than the percentages of whites (42%) or Hispanics (46%) who say this. Overall, 69% of adults with family incomes below $30,000 say they are falling behind the cost of living; that compares with just 26% of those with incomes of at least $75,000. Nearly half of Americans (46%) say that Wall Street helps the U.S. economy more than it hurts, while 39% say Wall Street hurts the economy more than it helps. Views about Wall Street’s impact on the economy are little changed since 2014. In 2011 and 2012, more said that Wall Street hurt than helped the nation’s economy. As in the past, these views are divided along partisan lines. More Republicans say that on balance, Wall Street helps the economy more than it hurts it (55% vs. 31%). 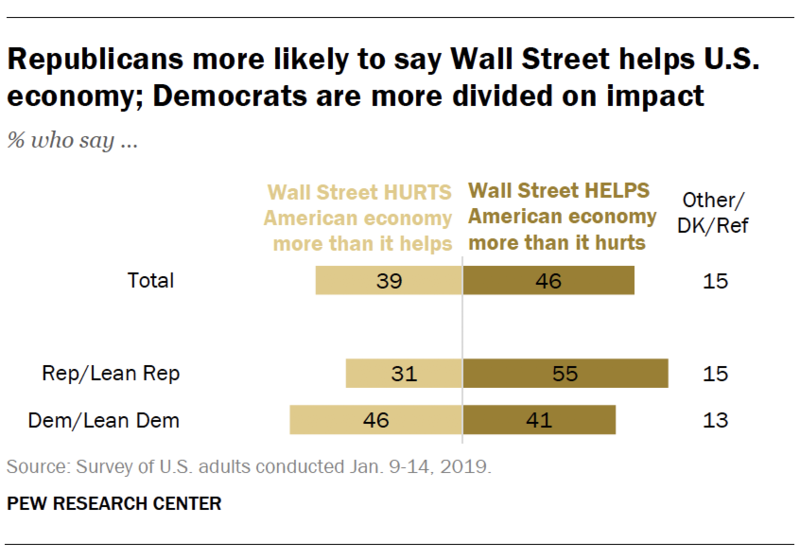 Democrats are more divided on Wall Street’s impact: About as many say Wall Street does more to hurt the economy (46%) as say it does more to help (41%). Seven-in-ten Americans now say they are dissatisfied with the way things are going in this country, while only about (26%) say that they are satisfied. Public dissatisfaction with the state of the nation is higher than at any point in the past year, and it has increased 9 percentage points since September (when 61% of adults said they were dissatisfied). Today, as many Republicans and Republican leaners say they are dissatisfied with the way things are going in the country as say they are satisfied (47% each). This is a 12-percentage-point drop in satisfaction from September (when 59% of Republicans said they were satisfied and 35% were dissatisfied), and the lowest GOP satisfaction rating since late 2017. Just 8% of Democrats now say they are satisfied with the state of the nation, while 90% express dissatisfaction. While satisfaction among Democrats has dropped modestly since September (from 14%), no more than 16% of Democrats have expressed satisfaction with the way things are going in the country at any point during Trump’s presidency.